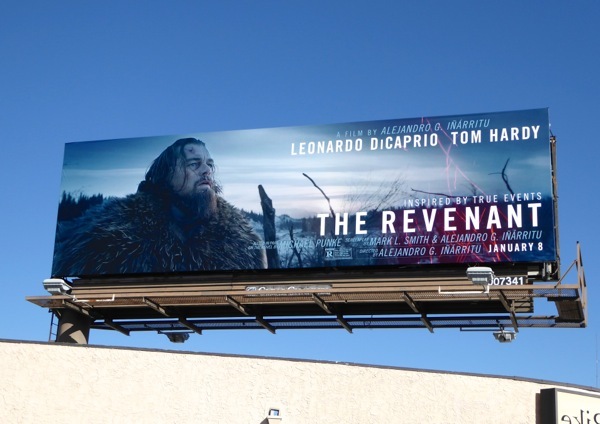 The film won't even be available for the public to see until the New Year, but The Revenant is already chalking up award accolade nominations, with Golden Globe nods for Best Actor in a Motion Picture - Drama, Best Picture, Best Director and Best Original Score. 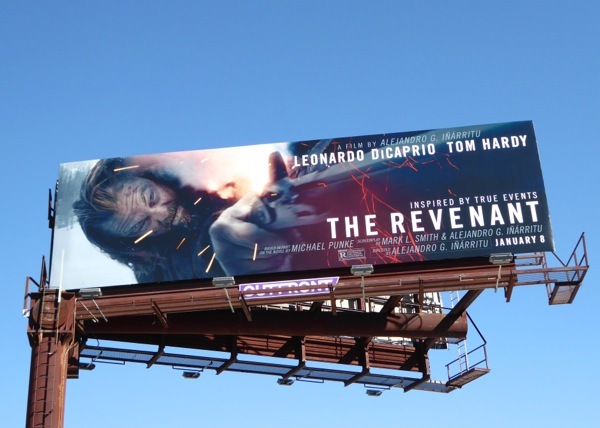 Leonardo DiCaprio stars as frontiersman 'Hugh Glass' in the 1820s American wilderness, in an epic tale of survival directed by Birdman's Alejandro González Iñárritu. 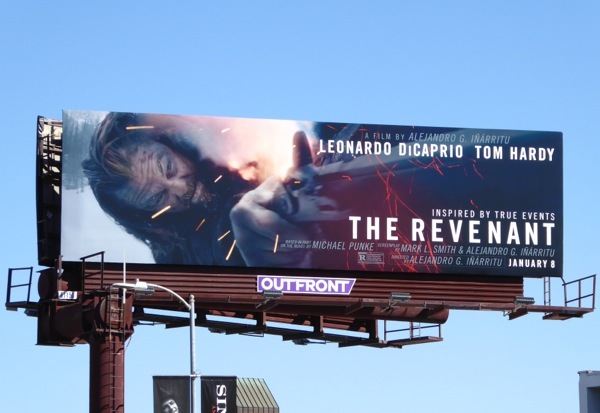 The legendary explorer is left for dead and betrayed by his own hunting team after a savage bear attack, and through sheer force of will he must survive the vicious elements and terrain to get his revenge and get back to his loved ones in this brutal frontier drama. 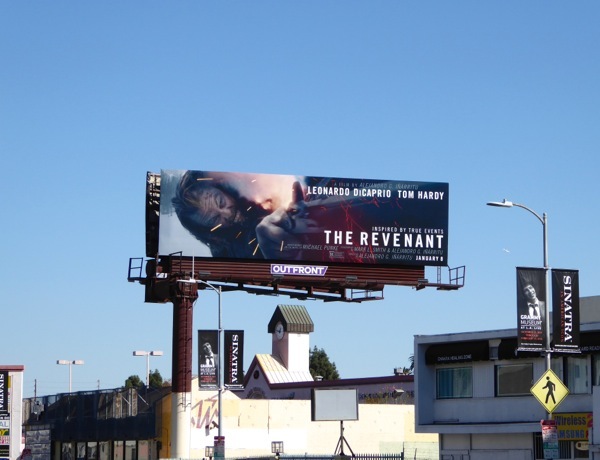 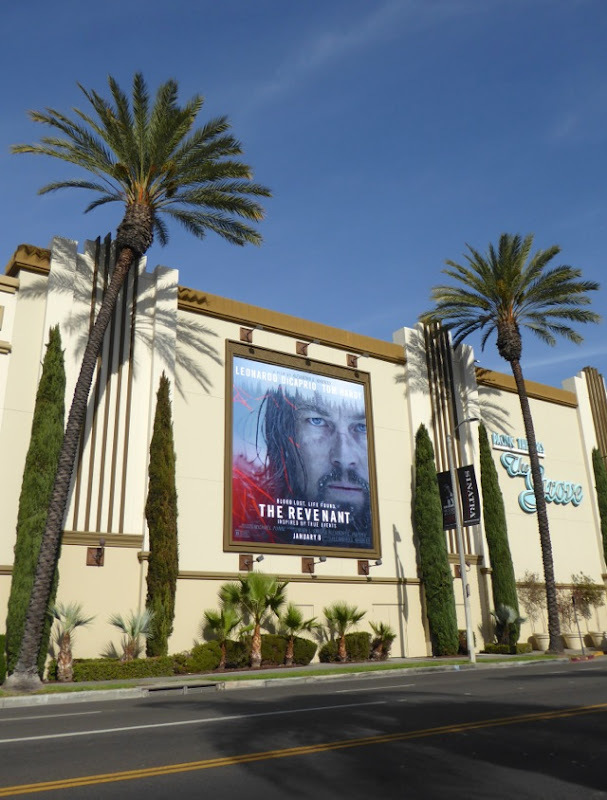 These arresting billboards for The Revenant were first spied along Santa Monica Boulevard in West L.A. on November 29, then later along 3rd Street and Melrose Avenue on December 9, 2015. 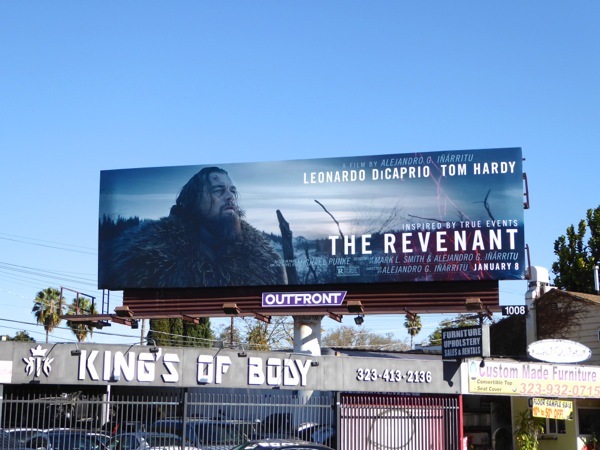 If you're a fan of Leonardo DiCaprio, be sure to also check out these Titanic movie billboards, these J. Edgar movie billboards and these film billboards for The Wolf of Wall Street. 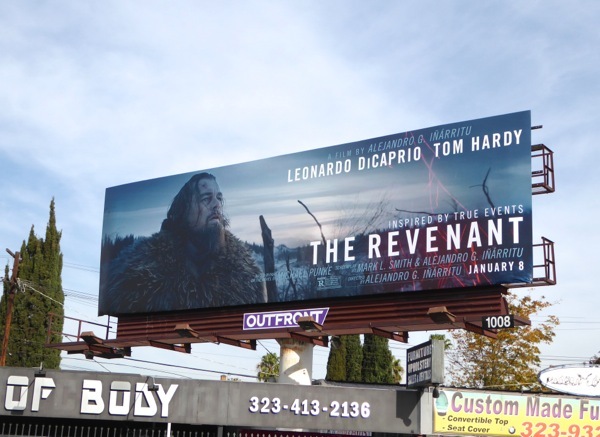 Not only does Leonardo DiCaprio have to navigate the treacherous wilderness in this movie based on true events, but now The Revenant also has to survive the fickle whims and surprises of awards season too. 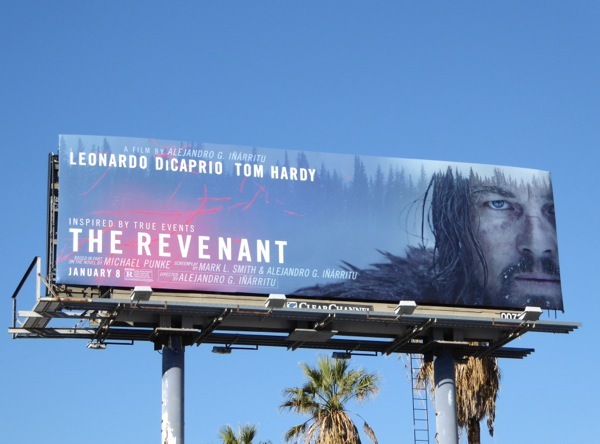 UPDATED: Here's also the landscape bulletin version of the portrait ad snapped along Sunset Boulevard on December 16, 2015, plus The Revenant movie billboard along Melrose Avenue with clearer skies. 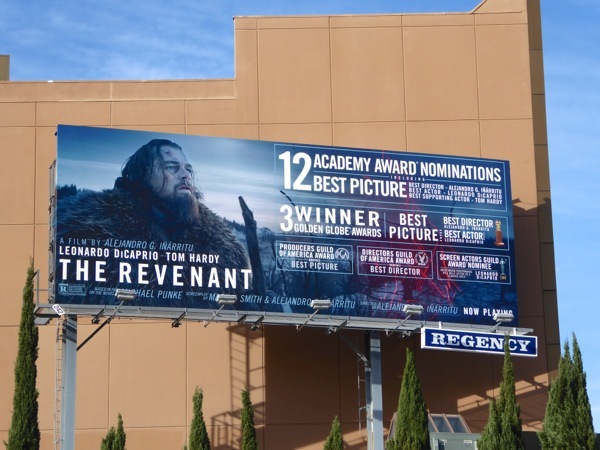 That billboard was later replaced by a version sporting all the film's Golden Globe nominations, spotted in the same location on December 23, 2015. 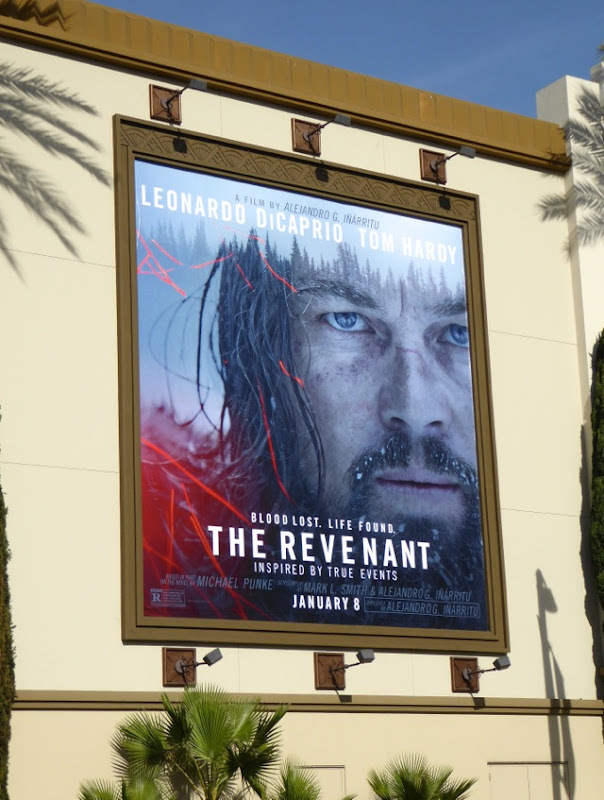 UPDATED: Fans of the film leading the pack with twelve Academy Award nominations, can also check out Oscar-nominee Jacqueline West's costumes from The Revenant on display. 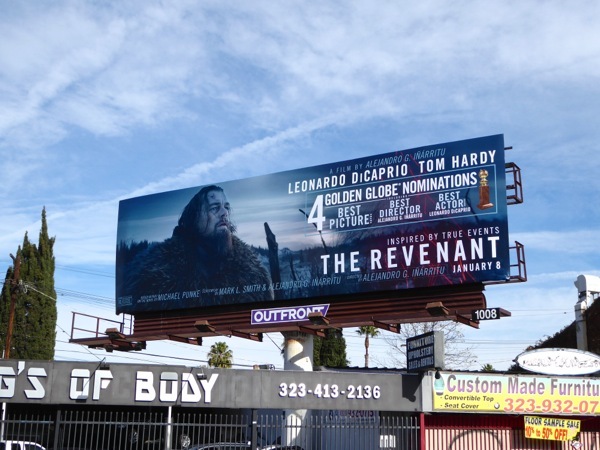 UPDATED: Following The Revenant's success at the Golden Globes and Critics' Choice Awards, here's also the Oscar nomination billboard for the consideration of all the passing Academy members, snapped along the Sunset Strip on January 21, 2016.